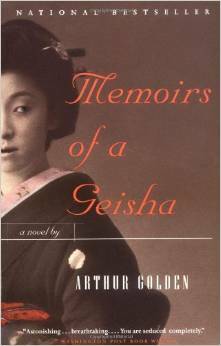 In Arthur Golden’s novel, Memoirs of a Geisha, we are presented a captivating part of Japanese culture. The story is told as the memoir of an elderly woman who has devoted her entire life to being a successful geisha. We first see her as a poor peasant girl, Chiyo, who is sold by her father into slavery. She will spend her entire youth learning how to please and entertain rich, older men. Sexual exploitation of the young girl is an integral part of her training. Appearances are paramount in her trade, so she must learn to camouflage her true self behind thick make-up, sculptured hair, and beautiful silk kimonos as Sayuri the geisha. The young peasant girl, Chiyo, seemed more real to me than the older version of herself as a successful geisha. But then, being real would not make Sayuri a good geisha. Certainly an interesting historical read.